Each year, thousands of refugees from Colombia and other countries like Syria, Iraq and Somalia flee to Ecuador escaping from violence. Ecuador hosts the largest refugee population in Latin America, with approximately 60,000 refugees and more than 175,000 asylum seekers. 87.5% of recognized refugees are Colombian citizens, while 12.5% are from other nationalities. 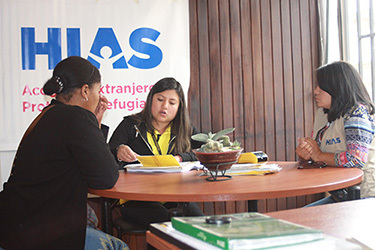 On average, HIAS Ecuador assists more than 35,000 refugees and asylum seekers per year and reaches an average of 5,500 Ecuadorians, including members of the host community and public officials. HIAS’ direct beneficiaries include those with significant legal and protection needs, single-parent heads of households, survivors of sexual and gender-based violence (SGBV), those with chronic illnesses and disabilities, older people, youth separated from their families and sexual minorities. 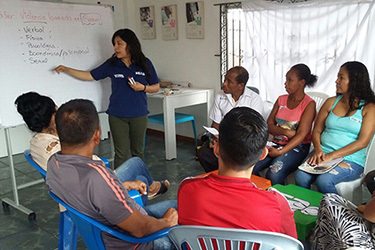 HIAS’ strategy in Ecuador focuses on a case management approach that provides refugee families with personalized and comprehensive assistance that meets their particular needs. Working hand-in-hand with governmental institutions, partner agencies and the private sector, HIAS promotes local integration and the development of sustainable livelihoods. The majority of refugees arrive in Ecuador having been exposed to violence and threats of forced recruitment into gangs or militias. A large percentage of Colombian refugees are women who were forced to flee when their husbands were killed or recruited into militias. In many cases, these experiences, which are often exacerbated by challenges in Ecuador, lead to increased anxiety and depression. HIAS’ psychosocial support focuses on promoting well-being through the development of community protection networks and integration activities. Additionally, HIAS provides individual psychosocial assistance for those cases which require additional support to overcome the effects of forced displacement. Ecuador’s policies are widely recognized for exceeding international refugee law standards; however, refugees continue to face workplace exploitation, xenophobia and serious challenges securing identity documents, work permits and official refugee status. They are in significant need of information, advice and education on their rights, legal procedures and available social services. HIAS works in close collaboration with the government, the UN refugee agency (UNHCR), legal assistance providers and others to empower, educate and support refugees as they seek to access rights, secure protection and find durable solutions. HIAS focuses on serving the most vulnerable refugees who receive specially-tailored information and guidance, whether relating to refugee status determination (RSD) and local integration, or in connection with voluntary repatriation, resettlement or alternative durable solutions. HIAS promotes self-reliance and the development of sustainable livelihoods (through entrepreneurship or working for an employer) by taking into account the individual experiences, skills and abilities of each person. In 2016, HIAS, together with UNHCR, implemented the Graduation Model Approach (GMA) nationwide, as an innovative program that aims to find solutions to the barriers that prevent refugees from becoming self-reliant. The GMA focuses on refugee families who live in extreme poverty, but who have the potential to generate income. Families are guided step-by-step through a personalized path to a help them move out of extreme poverty and "graduate."